The new Orbital Carbon Observatory successfully launched, made it into orbit, slid into place at the head of the A-train, and now returned its first data. Soon, we'll be able to track how carbon sources and sinks vary with time all over the planet. 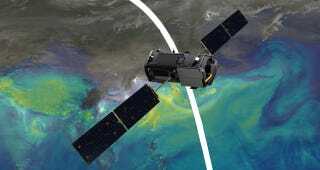 "The initial data from OCO-2 appear exactly as expected — the spectral lines are well resolved, sharp and deep. We still have a lot of work to do to go from having a working instrument to having a well-calibrated and scientifically useful instrument, but this was an important milestone on this journey." Image credit & read more: NASA. The actual data so far are visually underwhelming: grey streaks with darker banding indicating absorption, with streaks of greyscale data for each wavelength collected by the craft. The 760 nanometer band tracks atmospheric oxygen, while the 1610 nanometer and 2060 nanometer bands track carbon dioxide. This particular dataset was captured as the spacecraft was over Papua-New Guinea on August 6, 2014. The craft collects three frames per second in its orbit, detecting molecular oxygen or carbon dioxide levels for areas about 2.25 kilometers long and a few hundred meters wide. For the next while, the spacecraft's scientists and engineers will be collecting more data to calibrate the instruments, checking out their actual performance in space compared to their theoretical and ground-based performance. After calibration is complete, the data will be freely available to researchers to track how carbon sinks and sources change on our planet both spatially and temporally. We'll hopefully identify places where we poorly understand the carbon processes, using the spacecraft's data to target future research. To learn more about the observatory, here's 35 fascinating facts about the spacecraft, its history, and its not-so-graceful attempts to get into orbit.